If you’ve read my blog or just know me, you know I’m not one to follow convention. Whenever I do something, I want it to be unique and getting an engagement ring for Victoria was no exception. The last thing I wanted to do is pick out some mass produced ring off the shelf and give it to her. In my opinion, that doesn’t have a lot of meaning to it and I wanted to make something that counts. When most people think of an engagement ring, they only think of a strictly diamond ring. While there are strong marketing campaigns behind this, one very overlooked stone is the amethyst. While a diamond might be forever, amethyst symbolizes deep love, happiness, sincerity, and wealth. This is everything I wanted to give to Victoria. Another great thing about amethyst is that the largest deposits in North America are in Northwest Ontario, right outside of Thunder Bay. If you have also read my blog or just know me, you know I love visiting Thunder Bay. In many ways this has become a bit of a second home to me. 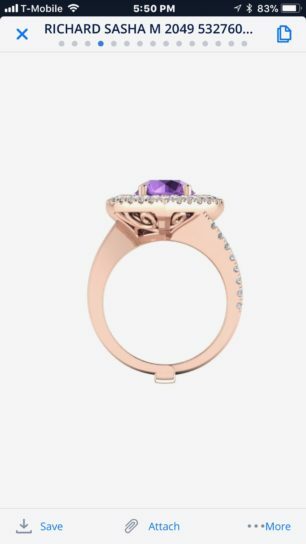 I had been floating in my head for a while how I wanted to have a custom ring made from amethyst that I had personally mined from a mine up in Thunder Bay. I didn’t know the logistics of when I’d go up, but this was something I really wanted to do. Fast forward to October and I had to make an impromptu trip to Wisconsin due to my dad having some heart issues. Thankfully, everything went well with the procedure my dad had. His recovery happened quickly. Once he had passed the 24 hour mark where he didn’t need someone present, I then decided the time would be right to go to Thunder Bay. One thing I’ve found about Thunder Bay is there’s an amazing sense of community there. 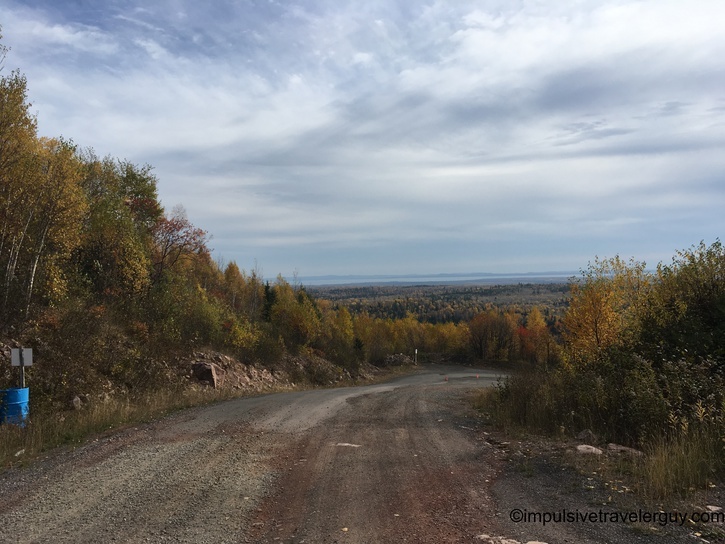 This community extends online in the form of a group called, “Thunder Bay Memories.” I have posted a bunch of blog entries there and my blog has grown a bit of a following from that area. This group has never failed me when I have asked for suggestions for local places to try out and blog about. 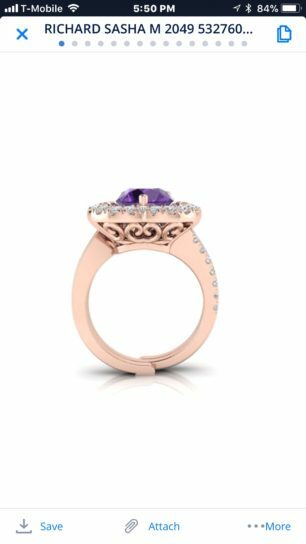 I decided to get some recommendations on places I could get an amethyst for the engagement ring. 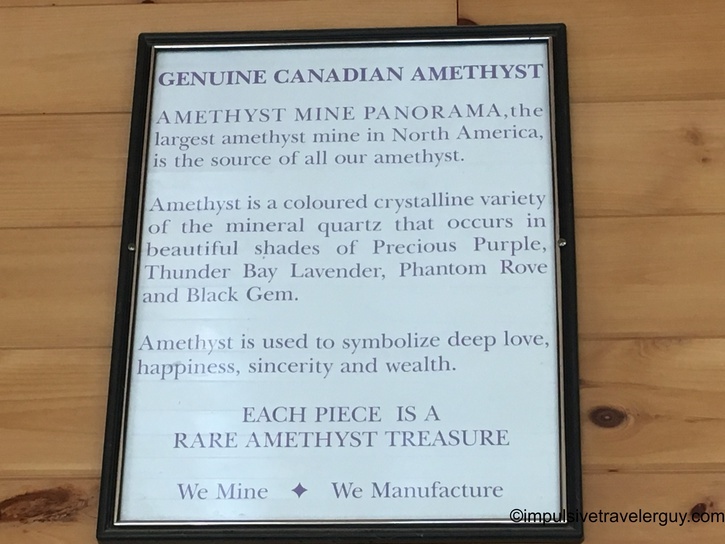 Many of the members pointed me to the Amethyst Mine Panorama, which is actually the largest amethyst mine in North America. I saw I was going to make it merely days before it closed for the season so I quickly went on a mission to Thunder Bay to get there in time. Now the mine is down a bunch of backroads in the middle of nowhere. It was actually a fun drive and I got to see a lot of Rural Canada when the colors were at their fall peak. At the mine, they have self-guided tours and a large group was there waiting to start their self-guided tour. I waited until they had set off. I worked with the lady behind the counter and explained what I was looking to do. 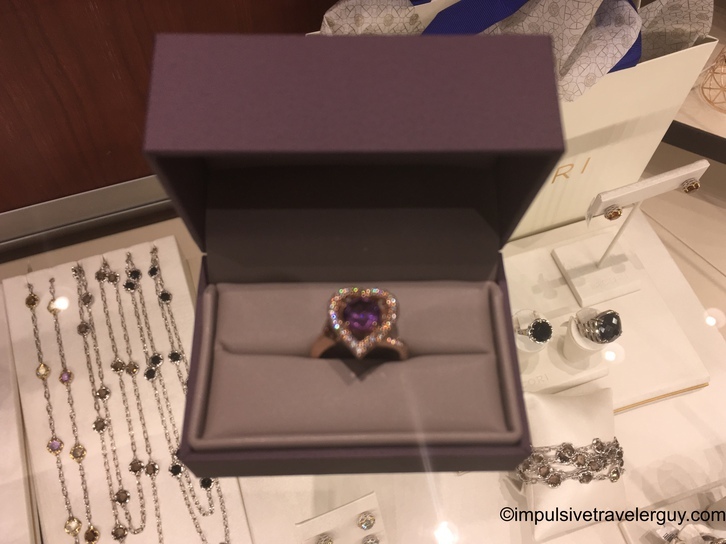 She took me over to the jewelry grade amethysts and we started looking at them. Now I don’t know anything about jewelry. One amethyst that initially caught my eye was a 4 karat one. I thought it would be perfect until I did a quick Google search on my phone and found that the average size of a diamond ring in the United States is around 0.9 karats. 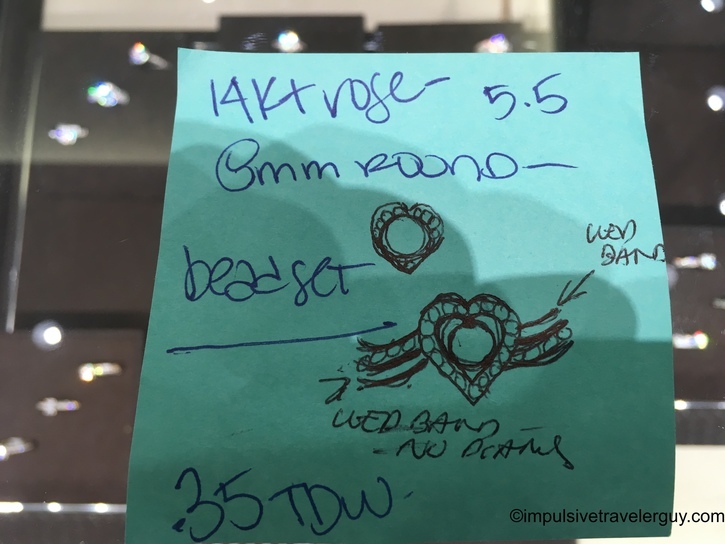 Most celebrity rings are only 3-4 karats, so this ring would have been absolutely huge, especially considering the fact I wanted to add diamonds and other stuff to it. 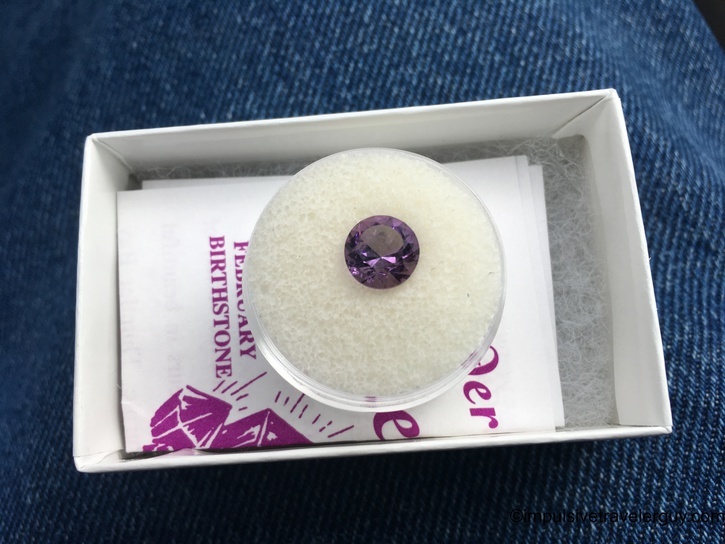 I found a similar 2 karat amethyst that I thought would be perfect. I proceeded to buy it and then took it back and locked it in my car. Before I left, I wanted to take the self-guided tour and see the exact place the amethyst was mined from. The pictures of this are in my blog entry about the Amethyst Mine Panorama, but it was really cool to see this mine in action. I headed back to Thunder Bay and spent some time with my friends there. As always, I had a great trip up there and I am always a bit sad when I have to leave. I headed back to Wisconsin for a while and then did my drive to Texas. 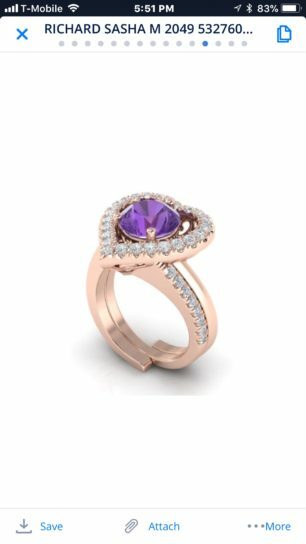 Now that I had secured the amethyst, the next step was finding a place to have the custom ring made. I started asking around and a friend recommended Diamonds Direct. I called them up and they told me they did make custom rings and to drop by sometime to start working on it. I actually surprised Richard, the guy who helped me design the ring. Since The Domain is half a mile from my apartment, I literally showed up about 10-15 minutes after calling. 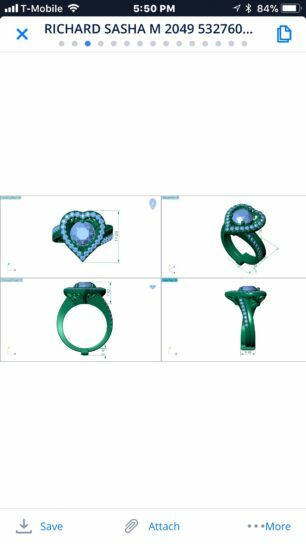 After he got done working with his current customer, we worked on a sketch of the ring. 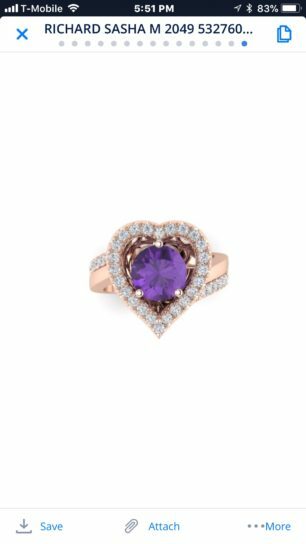 I wanted the amethyst to be the center stone and then to have a heart shaped halo around it with diamonds. I actually learned what a halo was since I was describing it in less technical terms for a jeweler. 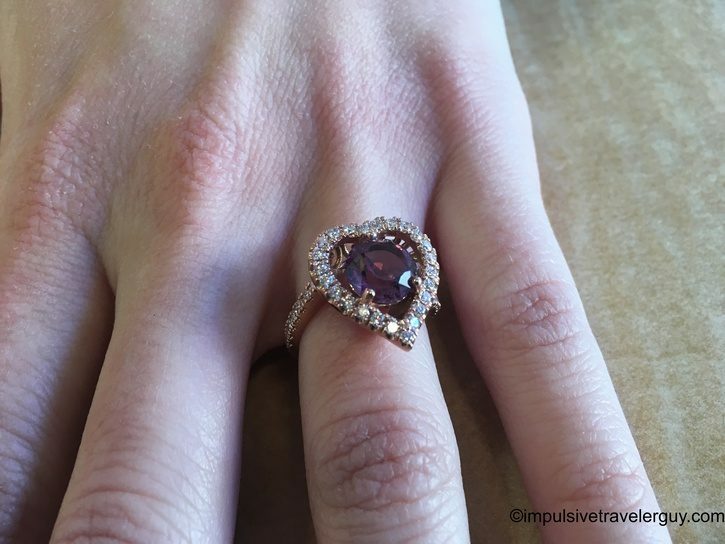 We also decided that rose gold would be the best for really bringing out the color of the stone. I was told it would be about a week before I got the CAD drawing to approve. In about that time frame I did receive them. The ring looked great so far! Shortly after receiving the CAD drawings, I approved it. Now was the waiting game. I was told it would take a month or so for them to fully make the ring. When I did finally receive notification it was done, I immediately drove to Diamonds Direct and picked it up. It turned out better than I thought it would! While it looked great in the box, it looked even better on Victoria when she said yes! As you can see, I’m not as much for convention. The making of this ring was a several month process that involved me going to another country to source the main stone in it. In the whole scheme of things it was insanely awesome I was able to do this and this adventure (minus the whole my dad having heart issues) is one of my favorite adventures I have taken. I’m glad the ring is one of a kind for my one of a kind Victoria!